by rigid rules, power-seeking, and institutional machinations of Rome's Branch. Did Roman branch religious feudalism, with its militarism and stratification, steamroll Ireland? At what cost to the original concepts of Christitanity. Kells. Kells has lent its name to the masterpiece from the monastic, medieval era, the Book of Kells. It also is the site of a later Synod of Kells, which transformed the Irish church into a Rome clone. The Book of Kells, book by Bernard Meehan, see below, traces the traditions of Columcille, born born 521 or 522 into the aristocratic O'Neills, at Tir Connail, near current Donegal. And to the town of Kells. The Book of Kells itself was kept at the town of Kells, in Meath, some 40 miles from Dublin, and is now at the Long Room of Trinity College, Dublin. The decorated pages, the illuminations, colour, "exuberance and wit," of the work, see its story at this work, The Book of Kells, by Bernard Meehan, who heads the research collections and is keeper of manuscripts at Trinity College, reviewed at Financial Times, Nov.24-25 2012. The 11th Century Annals of Ulster is said, in the article, to call it primh-mind iarthair domain, "the most precious object of the western world". It could have been composed, at the outset at least, by monks following St. Columba, or Columcille, on Iona, off the isle of Mull, on the western coast of Scotland in 800. See Financial Times. The term "codex" is appropriate to distinguish manuscript volumes from the later print. And, it is not necessarily accurate, despite its charm, see review, with an "erratic text" and scriveners' errors among the four scribes (understandable with working conditions in a stone beehive hut, winds blowing), some humorously and wittily corrected, or not, and with puns. On what is it written? 180 calfskins, showing the community's wealth. Pages remaining: 680. How fast did the scribes write? 180 words per hour. See Review. So what happened after the brilliance of the Book of Kells, that so harnessed creativity that is there any other manuscript to surpass it? What evolved in the religious realm -- so that the brilliance of a Kells would be prevented thereafter. 1. From a time of autonomy and respect for difference among Christians, Ireland was overcome by militant and highly organized Roman Orders. Trace from European roots how the Irish were subjected to compulsory conversion. Who really won? The newcomers came by invitation of an already converted Abbot who sought a new abbey to enforce a strict rule. Benedictines; to Cistercians: Now are the Cistercian Order of the Strict Observance, or Cistercian Order of the Common Observance, or Trappists. Start, however, far earlier, to see how the Irish really had no chance. 529 CE -- Saint Benedict established the Benedictine Order on the continent, monasteries and monks (were nuns included in the early years?) with its long periods of prayer and work in the fields, and their black robes, see http://www.catholicculture.org/culture/library/view.cfm?recnum=4425. The Rule, laid out by Benedict at Monte Cassino in Italy, by which the Benedictine monasteries and monks were governed, and which survived medieval Europe's violence and changes, required three oaths: "obedience, stability, and conversion in the way of life." See http://www.middle-ages.org.uk/benedictine-rule.htm . The Rule afforded much latitude, autonomy. The way of life was austere: no property ownership, stay within the monastery bounds unless special permission, black robes (the Black Monks), early to bed, and various enforcement mechanisms, not even letters from home. It was like a corporation with a life-Abbot. But Benedictines, in the view of some, relaxed too much the Rule. Note: no chastity. Many monasteries were "double monasteries", both genders. Soon, other orders, such as at Citeaux with its vows of austerity and silence, branched into the more rigid structure, ultimately becoming, through Bernard of Fontaines, another order the Cistercians, or white monks becuase of their black robes but with white tunics, see below at 1112. It was a time also of large numbers of double-monasteries in England and mainland Europe, see http://www.osb.org/gen/benedictines.html, headed by Abbesses, and broad acceptance of women religious in ministerial roles up to the 1000 and 1100 year marks, generally. Digression: Women in ministerial, ecclestical power positions. After that, Gregorian reforms initiated strong limitations and consolidation of power in the male religious. See Katie Ann-Marie Bugyis, of the Medieval Institute, University of Notre Dame, paper entitled Sacerdotes Christi, Women Confessors in High Medieval England. Click and follow at Abstract doc . Fast forward: The Benedictines themselves were marginalized in the 1100's, see http://www.osb.org/gen/benedictines.html, as Dominicans, Franciscans and Cistercians -- with their misogyny, drive to take over areas where women were indeed doing well and financially prospering, and the male-favoring, and celibacy, stricter rules, took over. 563. Meanwhile, in 563, the Celtic-Irish Columcille-Columba set up a monastery on Iona to better convert the Scots Picts. The community then fostered Lindisfarne, in Northumberland, set up by in 563 by another monk from Iona, Aidan. These were not affiliated at all with the Roman movements. 795: Violence. Vikings invaded Iona. An era of further raids, and then subsequent settlements ensued. In 802, Vikings burned Iona. In 806, 86 inhabitants were killed, see Financial Times review. So, the community of monks moved to Kells, where there was a hill-fort connected to royalty, for refuge. This was a small group, if an illustration in the Book of Kells is followed. There are angels holding some reeds. And the Vikings attacked and raided and settled, year after year, century after century. 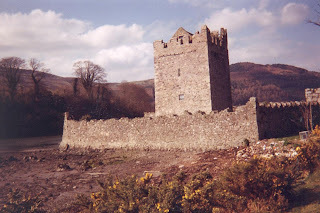 See http://www.yourirish.com/history/medieval/vikings/ The impact was devastating on the Celtic church, and its lack of central authority and organization. The country in 1000 or so was beginning to emerge from centuries of turmoil, with Viking invasions, raids, and then settlements, and population shifts. A Celtic Christian religious life continued to consist of plain living and emulation of good, even divine, behavior, either in withdrawing into deep contemplation, or joining in loosely bound communities and helping others or engaging in scholarship, and script copying. Then came a change in mindset for Rome. It had to establish itself independently, not a merely another aspect of Christianity. 1054 - The Great Schism. Roman Christianity broke from the Eastern Orthodox Christians, see http://www.middle-ages.org.uk/the-great-schism.htm/ The newly independent Roman branch needed converts, authority, turf, power on its own. So, after the early centuries of respect for-individualized interpretation of scriptures Christian, and loose organization geared to communication and ease of travel in Ireland, rather than uniformity; came the Roman version: Ritual and authoritarian dogma from the continent. The holy steamroller? 1112: Bernard, then of Fontaines, a nobleman, arrived at Citeaux in France with a 31 men, a band of other nobles seeking to become postulants, including "many gay young men of his acquaintance," see http://www.catholicculture.org/culture/library/view.cfm?recnum=4425. Bernard and Stephen, Abbot of Citeaux, set up many daughter houses, and by 1115, including another foundation, Clairvaux nearby. Bernard was first Abbot of Clairvaux. The "Charter of Charity" was established to supplant the looser earlier rule. Abbots of parent-houses were to convene periodically to set up common legislation, enforce, and visit all their foundaitons annually for purposes of supervision. The era of forced conformity had well arrived. The church militant was on the march. 1140 - The Bishop of Down, Malachy, requested of the Cistercians at Clairvaux that a new abbey be constructed to enforce a stricter rule. That came to be Mellifont. Accordingly, in 1142, Roman Christians set up the first Cistercian monastery in Ireland, called Mellifont, near Monasterboice, County Louth. The monastery was the first in Ireland to follow the architectural model used in Europe, see http://www.sacred-destinations.com/ireland/mellifont-abbey. Mellifont, within a few decades, had become mother-church to some 21 monastic places, and 800 or so monks. And the monks by then were all Irish, as the French had been made unwelcome and left. And, on the continent, the Order of Citeaux became prominent not as a new order, but a stricter Benedictine, see http://www.catholicculture.org/culture/library/view.cfm?recnum=4425 By the 13th Century, however, even Citeaux and the Cistercians were fading, along with other feudal-type organizations. 1153 - Dermott MacMurrough invaded land and ran off with a lady, time passed with battles to and fro, MacMurrough was expelled for bad behavior by the High King, MacMurrough went to the King of England, Henry II, for support in getting back his lands (who cared by that time about the lady, who had already been returned). Henry demurred, and suggested MacMurrough try to recruit noble efforts on his own. He did. He lined up barons and Strongbow. In exchange for promising his daughter to Richard FitzGilbert de Clare (Strongbow) in marriage, Strongbow agreed to support MacMurrough. Time passes, alliances go here and there, machinations. 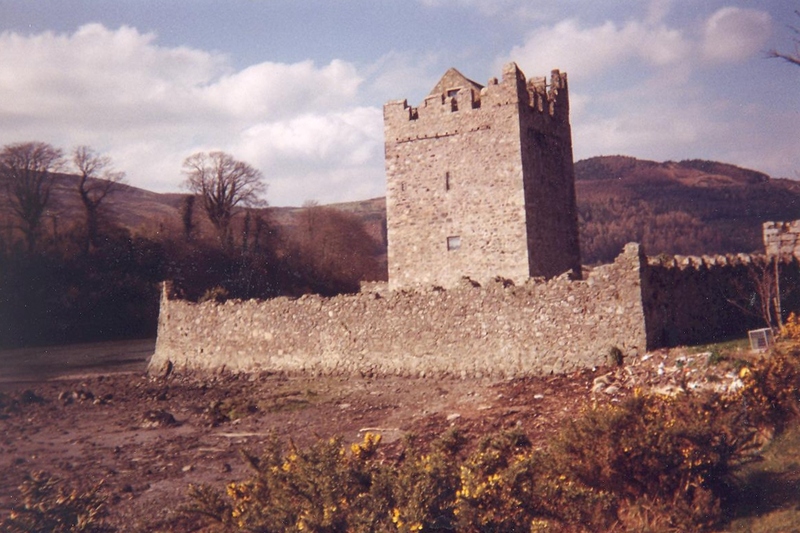 1249 AD Bonds between Irish and Scots tribes had remained strong, with English incursions into both territories. But the last traditional inauguration of a King of the Scots took place, for Alexander III, in 1249 AD. He was led to the sacred Stone of Scone, received homage of the people, and heard his pedigree recited in Gaelic, says Cousin Violet. So: Ireland. The creativity and love of the loosely-organized early Church was steamrolled. And, it has not stopped. The mindset of the church militant, the one way of thought and belief, the forced conversion, plagues us yet.